When I Varnish I like to go all out. My motovation for this comes from the fact of indoor air pollution. Some people smoke. Some people burn incense. Sometimes furnaces has problems and fill the house with nasty smoke. Growing up with one chain smoker in the house you realize that it leaves a stain on everything. I actually discovered that Tupperware did not come in an off white color until I left home. I currently live with a smoker. Though he is the most conscientious smoker I have ever met: only smokes in one room, always uses am exhaust fan, and our Tupperware stays clear, yay! It got me thinking, there are things in many homes that could really dull a painting. I was already familiar with varnish and decided I wanted to step it up to the next level. It is important to me that any piece of art I create be easy to restore to its original glory even if it is hung for years in a smoke filled room, there was a furnace explosion, or if ever it becomes dull from typical air pollution. I researched it and also corresponded via email with the helpful folks at Liquitex for advice. I have been using the method illustrated below since and though it does add time to the painting process it is worth it because of the piece of mind it gives. Step One: Isolation layer(s) is a layer of non removable clear paint over the entire painting. These products are non removable when dry. They are milky when applied but dry to a clear high gloss finish. 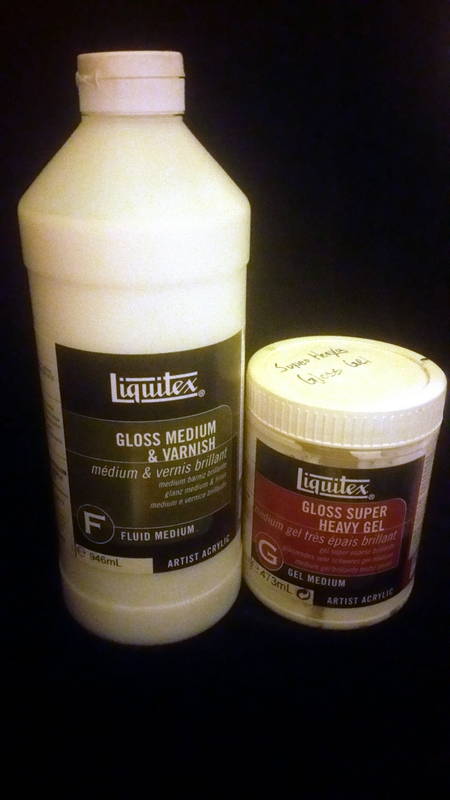 I use these two in combination depending the desired texture to create the isolation layer. I often do more than one coat, allowing the first one to dry completely beforehand. *Even if the eventual finish is going to be matte or satin you should use gloss medium for the isolation layer. I will let these dry until fully cured. 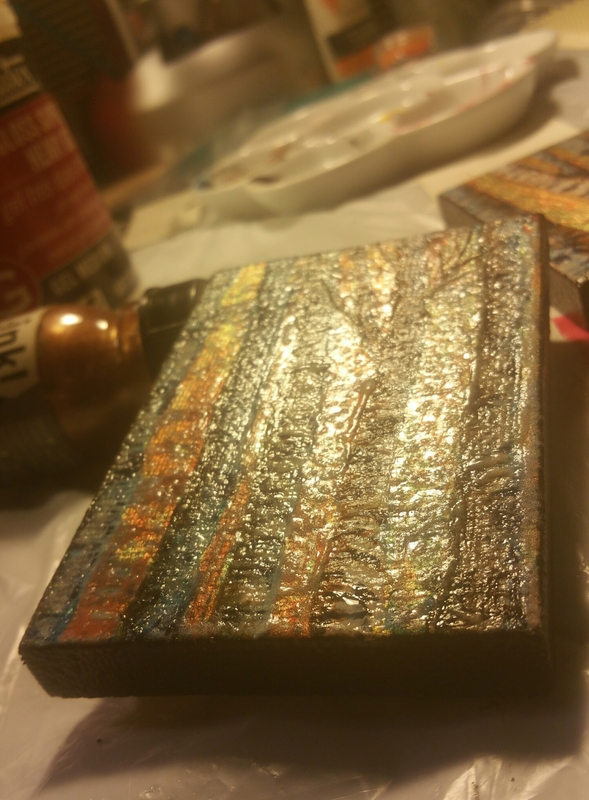 Step 2: The finish layer is the final layer (s) of removable varnish that determines the level of sheen on the painting. After the isolation layer is completely cured I will use a removable varnish in either matte, gloss or a mixture to achieve a satin finish. 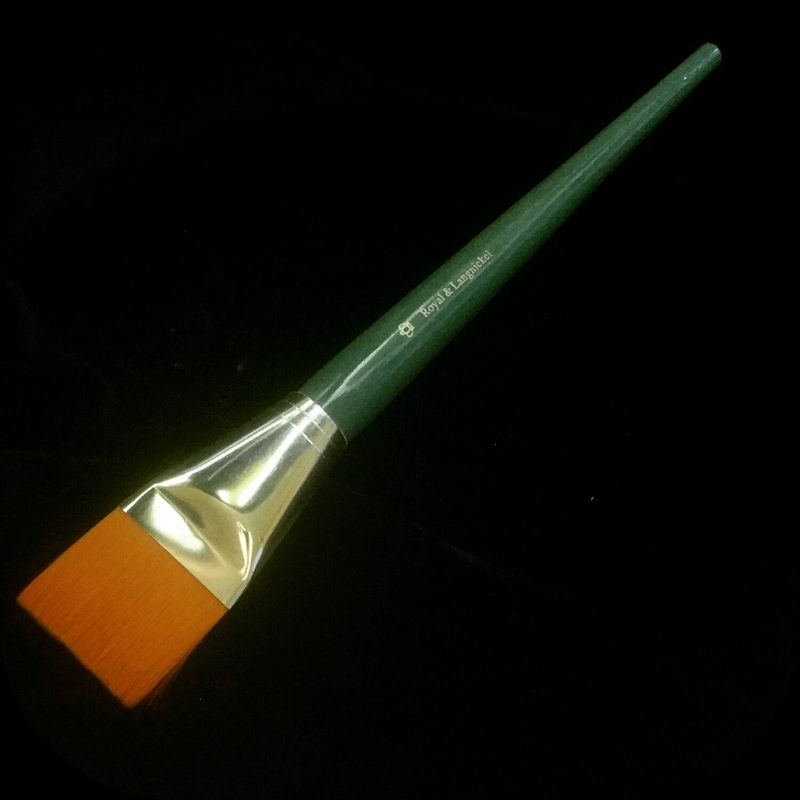 Removable varnish comes in both spray on and brush applications. The key to either type is to keep the coats thin and dry each one for 24 hours before beginning the next coat. This is to avoid cloudiness in the varnish when it dries. For thick or highly textures paintings a spray varnish may be the right choice to avoid cloudiness and get even coverage. Be patient between coats same as the brush on variety. *If you go with spray on application make sure you have proper ventilation. *When varnishing a painting make sure you read all of the manufacturers details and follow all recommended safety precautions. I recommend writing down the varnishing products used so they can be referenced in the future when it is time to clean the painting. You can include this info on the back of your finished work and or record it in your inventory control notebook. Finishing your paintings with this method assures that your painting can be cleaned to like new condition when the suface inevitably becomes dirty from indoor air pollution. When the time comes simply remove the dirty varnish worth it’s manufacturer recommended solvent. Then reapply a fresh new finish to the piece once it’s dry. Long live your art! Previous postNothing left to do except varnish and pick a destination.